The debut of Apple's latest smartphone on Friday has drawn huge crowds at Apple stores around the world, including a long, rain-soaked line at the company's flagship Fifth Avenue store. Today the iPhone 4S launches in the U.S., Canada, Australia, the U.K., France, Germany and Japan. Stores have opened at 8 a.m. local time to begin selling the device, which features Siri voice recognition and a speedy dual-core A5 chip. 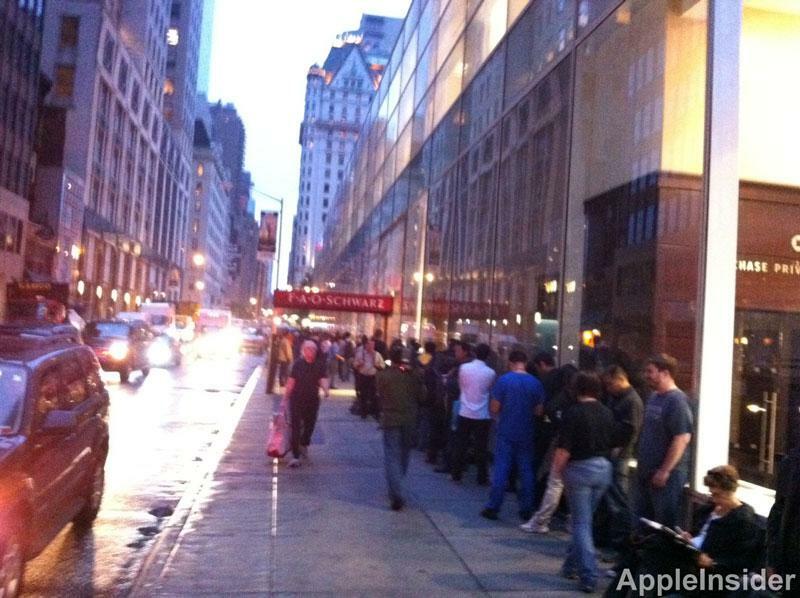 In the U.S., at Apple's flagship store in New York City, a long line braved poor weather to be among the first to get their hands on the iPhone 4S. 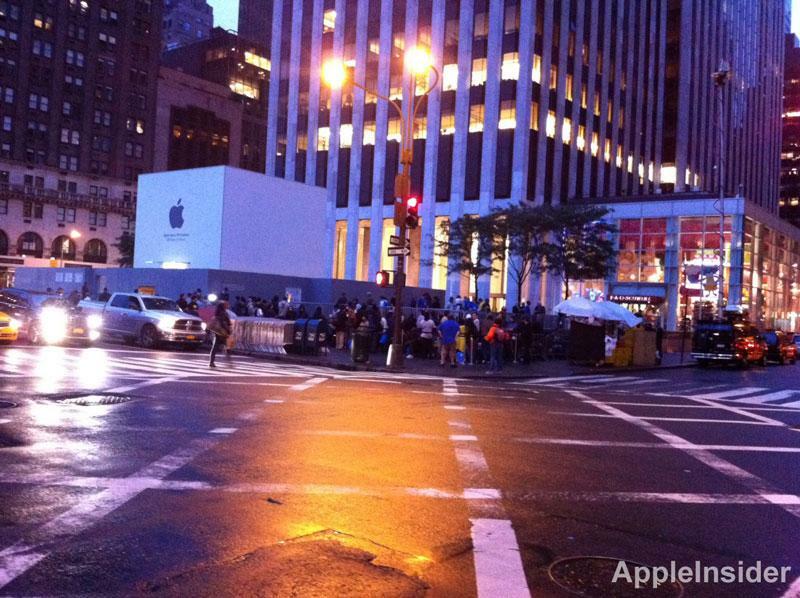 AppleInsider reader Ryan sent along photos and video (below), and noted that the line wrapped around two sides of the block as of 7:30 a.m. For comparison, the iPhone 4 launch crowd was four sides of the block, though weather conditions were better. The iPhone 4S is available in black and white, and in capacities of 16GB, 32GB and 64GB. It starts at $199 with a new two-year service contract in the U.S. This year marks the first time a new iPhone will debut on three carriers in America. In addition to AT&T, which has carried the iPhone since 2007, the iPhone 4S is also available at launch on Verizon and Sprint. Australians were the first in the world to buy the iPhone 4S at an Apple Store, and TechGuide was on hand in Sydney, where a large crowd was cheered on by Apple employees for the start of sales. Customers were handed cards to help them identify the color and capacity of the iPhone 4S model they planned to buy. Many customers turn to waiting in line at retail stores to buy the iPhone 4S on launch day because online orders sell out quickly. Almost immediately, Apple sold out of its initial run of preorders, and customers hoping to get a handset on launch day were given a shipping estimate of one to two weeks. Apple announced earlier this week that it set a new record by pre-selling one million iPhone 4S preorders on the first day. That topped the 600,000 preorders of the iPhone 4 sold in one day 2010. Analysts expect the iPhone 4S to be a hot seller beyond this launch weekend, throughout the holiday buying season and over the next year. A set of recent predictions from Wall Street analysts called for 3 million sales on the launch weekend, and 25 million this year.